I suppose it’s not really something that you think about until you are in a position to need it. Well, this week that time arrived and after seeking recommendations we were able to make the arrangements to get things sorted out. 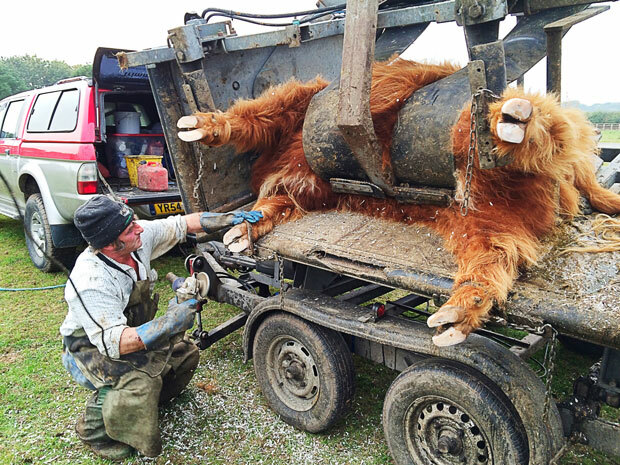 So what on earth is he rabbiting on about, you may well be asking yourself, well you see our Highland cattle needed a bit of a pedicure and although Wendy is up for most jobs around here, this was a little beyond her extensive capabilities. We therefore called in the cavalry in the form of the Yorkshire Foot Trimmers. Although I had researched online and seen pictures of how they would take care of our cows feet, I was excited to be able to watch Robert and Mandy in action. The cows were penned in and ready when the trimmers arrived and after backing their trailer up to the gate they set to and within an hour, they were all done and dusted. In short, they just walked each of the cattle from the pen and race into a crush, which sat alongside their trailer. After strapping them in and making each cow comfortable, they pressed a button which then rolled the cow onto its side, on the back of the trailer. The cows were content and stress free and it enabled the trimmers to work safely on their hooves, without fear of a kick in the shins, or worse, anything up to 1800lbs parking itself on their toes. It was great to see the ladies galloping around the field afterwards, all that pampering had clearly sent them a bit giddy. A few weeks ago, I made a discovery, well if I’m honest it wasn’t really a discovery at all, rather I was introduced to a piece of machinery that has transformed things around here. A gardener friend was around spraying my nettles, as I explained some weeks ago and whilst he was here he thought he would bring and show me a piece of kit which he thought would reduce my workload and guess what, he was right. On first sight I thought, “Look at that cronk”, as it just looked like a clapped out old mower, but then he demonstrated what it could do for me. I couldn’t believe my eyes, it could cut through all my rough grass, old nettles, brambles and undergrowth like nothing I’d ever seen before and the best bit was, he was leaving it for me to borrow for a few weeks. Well, to say that it has had some hammer is an understatement. The wooded areas where we wanted footpaths have been getting cleared and every time my Dad comes to help on the farm, he just heads straight for the machine and heads off to clear through some more undergrowth. In fact within a couple of days of the machine arriving here, I had already been on the phone trying to cadge it off him permanently and although I failed to convince him that it was a good idea, he did put me in touch with a supplier who could build me one of my very own. So, this week I was able to go and pick up my very own ‘Hayterrette’ and my goodness it’s going to save me so much time! It has proven to me once again, as this situation has demonstrated, that there are people out there who are willing to go the extra mile to help others. I guess it’s now up to us to now pay it forward with that same kindness…Thanks Tony!